How many times have you been driving down the road and wished that you could simply speak into your iPhone and the text just populate automatically? If you’re like me, it’s happened a lot. The bad thing is that the alternative is texting while driving, which according to a recent survey, now accounts for 25% of motor vehicle accidents in the United States. 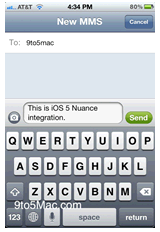 Fear not however, because the rumor mill is churning with news that the next iOS release (iOS 5) will feature the “speech-to-text” functionality. Now you’ll be able to speak into your iPhone to reply or initiate your text messages.